Vitamin C tablets for strengthening the immune system, treatment and prevention of the flu and common cold, various anti-inflammatory and anti-infectious actions, fast scab formation, prevention of damage caused by smoking and diabetes, reduction of hypertension and protection against cardiac disease and cancer. Vitamin C is an antioxidant, which participates in about 300 different biological processes in the body, supports various healing processes and is used in the treatment and prevention of a variety of health problems. It strengthens the immune system, reduces the risk of developments of infections in the body and, at high doses, alleviates flu and common cold symptoms while shortening the duration of the disease. Vitamin C participates in the breakdown of cholesterol and its regular consumption reduces the risk of developing cardiac disease. As a powerful antioxidant, vitamin C neutralizes free radicals of oxygen and toxic metals, prevents formation of carcinogens and protects against the development of cancer. Vitamin C is an essential food supplement for every smoker due to its capacity to reduce damage from smoking - every cigarette "robs" the body of 25 mg of vitamin C.
Vitamin C is needed for the formation of collagen and connective tissue, contributes to fast scab formation and wound healing, including bedsores, and is important for maintaining a healthy looking skin. Vitamin C also plays a role in preventing development of cataract and gum disease. Vitamin C reduces cellular histamine levels, which eases the intensity of allergic attacks. It is needed for the regular formation of neurotransmitters and regulation of hormonal activity. Vitamin C is indispensable for maintaining various bodily functions, such as the conversion of folic acid to its active form, increased iron absorption and formation of carnitine, which is responsible for converting fats to energy. Vitamin C also plays a role in the breakdown of drugs and their elimination from the body. Remark: It is important to note that the dosage required to obtain a therapeutic effect is much higher than the recommended dose for the prevention of scurvy caused by vitamin C deficiency. Instructions: One tablet daily, to be taken with a meal. 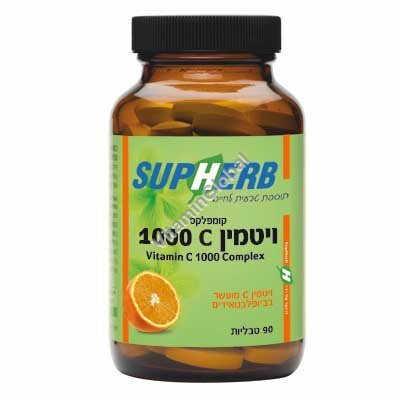 Vitamin C 1000 Complex is available: in packages of 90 tablets.